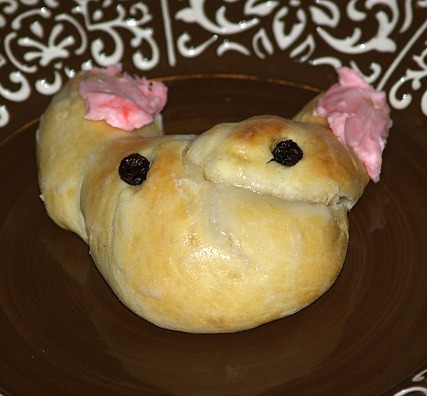 I learned how to make fun Easter recipes when I was young. These are nice to have around whether you have children or not. When entertaining family or friends, these creations often offer a way of getting the conversation started. Many years ago when I had a restaurant, a regular customer came in and ask me for ideas for Easter bonnets. She was going to be in an Easter parade. They were retired from the military and the contest was going to be at the local Navy base. 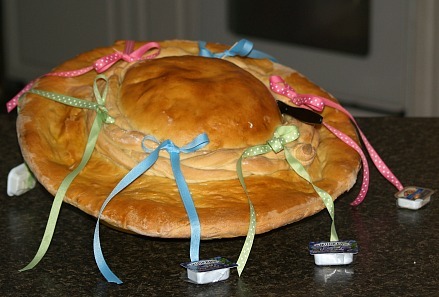 I only knew a lot about food so I said "I will make you an Easter bonnet out of bread dough". 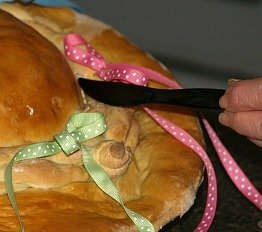 I had no idea how it would turn out but I learned how to make one of the best fun Easter recipes. I started with enough bread dough to normally make three loaves of bread. I took out an oven proof bowl and set it in the middle of a large pizza tray. 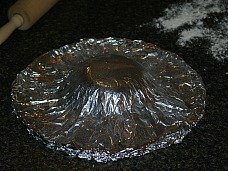 I wrapped both with foil holding the bowl in place and then I lightly greased it. I started by rolling two thirds of the dough in a large circle. I then placed the center of the circle over the greased bowl shaping the hat over the bowl and extending the dough to make a wide brim. I took the remaining dough and shaped into three long ropes. I took the ropes and braided them to make a hat band. After brushing the hat with egg water mixture, I baked it until it was golden brown. When it was completely cool, I decorated it with butter, jelly and plastic knives to spread. I wrapped the entire hat in lots of plastic wrap to keep it clean while my friend wore it on her head. She won first place! Afterwards, all the guests there could not wait to get a piece of that homemade bread. 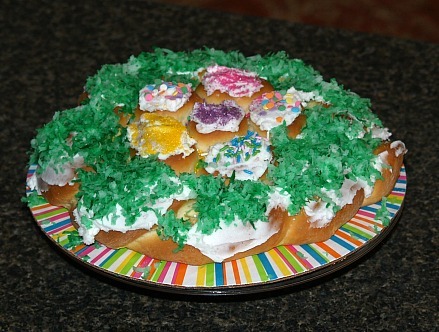 All agreed that I learned how to make one of the best fun Easter recipes. 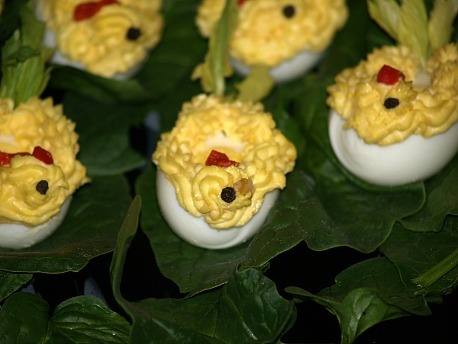 Fun Easter recipes can taste great as well as be “eye catching”. This clever coffee cake is just an example. Heat milk, sugar, shortening and salt until sugar dissolves; cool to lukewarm. Stir 1 cup of flour into milk mixture; beat until smooth. Add softened yeast and egg to milk mixture. Place dough in a greased bowl turning to coat; cover and let rise about 1 hour. Punch dough down and divide into thirds; cover and let rest 10 minutes. Shape 1/3 of dough into shape of 6 “eggs”; place close together in the center of greased baking sheet. Shape remaining dough into 2 “ropes” each 26 inches long; twist ropes together. Coil ropes around the eggs to form a “nest”; seal ends together. Cover nest and let rise about 1 hour; PREHEAT oven to 375F degrees. Bake for 15 to 20 minutes; remove nest from pan to rack and cool. Tint coconut green; frost with icing and sprinkle nest with green coconut. Sprinkle eggs with candy decorations if desired. 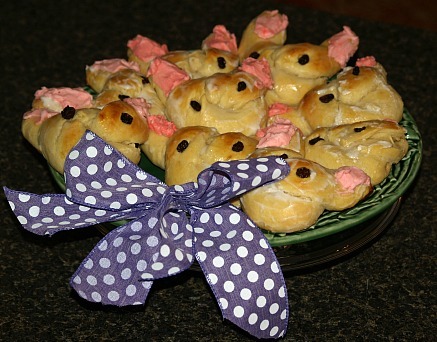 By creatively shaping these sweet rolls into bunnies, you can add a little spark to your Easter breakfast or brunch menu. All will agree these are one of the great fun Easter recipes. Combine butter, scalded milk, sugar and salt; cool to lukewarm. Soften yeast in lukewarm water; stir and combine with warm milk mixture. Add about half of the flour and beaten eggs to the mixture; beat well. Add enough of the remaining flour to make a soft dough; mix thoroughly. Turn dough out onto a lightly floured board and knead about 10 minutes or until smooth and satiny. Place dough in a warm greased bowl; brush surface very lightly with melted shortening. Cover dough and let rise in a warm place (about 80F degrees) about 2 hours or until double in bulk. 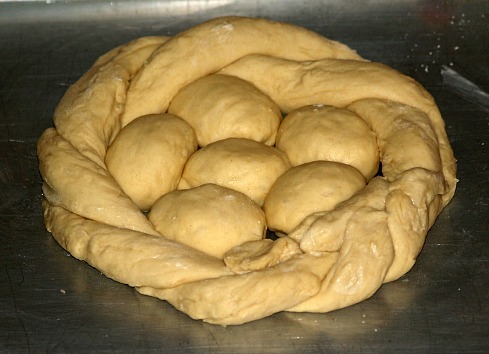 Turn dough onto board and shape into long ropes ½ to ¾ inch in diameter and 10 to 12 inches long. Tie in loose knots bringing ends up straight to form ears; press in raisins for eyes. Brush with diluted egg yolk; bake at 375F degrees for 15 to 20 minutes. While still warm frost with powdered sugar icing tinting part pink for the ears. Start with shelled hard cooked eggs. Cut off a thin slice lengthwise to make a flat base. From another hard cooked egg take the yolk; mash and mix with mayonnaise to make soft and smooth. Place yolk mixture in pastry bag with tip to shape wings and the head of a chick. Insert a small bit of nut (or peppercorn) for the bill and a strip of pimiento for the chick’s comb. With a small pointed knife make a slit at the tail end; insert a celery leaf or other small green leaf. 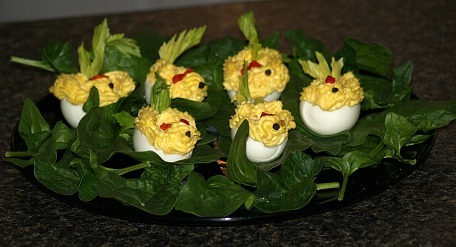 When finished place chicks in a nest of salad greens on serving plate.